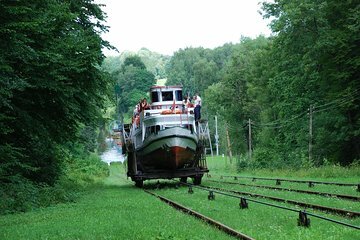 Enjoy a unique sightseeing experience in Poland on a full-day tour of the Elblag-Ostrada Channel from Gdansk. Climb aboard an amphibious vehicle that functions on both land and water and take an unforgettable trip on Europe’s only functioning inland waterway system. Relish the spectacular Polish countryside as you admire views of rolling hills and dramatic valleys. Make a stop in the quaint town of Buczyniec and visit its interesting museum (own expense) and relax in a comfortable, air-conditioned vehicle during round-trip transportation from your Gdansk hotel.